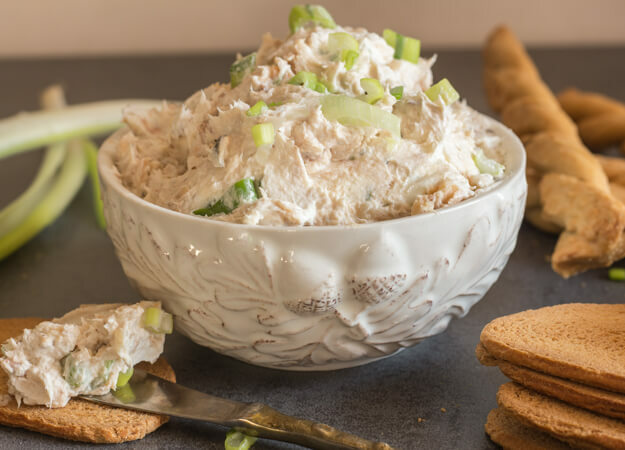 Easy Smoked Salmon Spread, a fast and easy perfect anytime appetizer dip. Serve with crusty bread and crackers. Delicious. Do you have a fast and easy dish that you have been making for years and years, and it seems that if you don’t make it for a while that something would be missing? Well this is it for me, actually probably more for my husband. He tried this the first time many years ago in Toronto when my Mom used to make it. It is probably the best appetizer spread I have ever eaten. I always make this for our Fish Dinner on Christmas Eve and usually during the year whenever we have friends over for dinner. Trust me, it is on the table and gone within minutes. 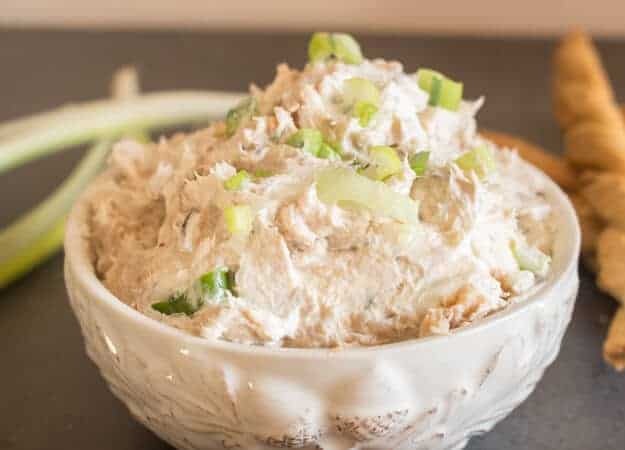 Easy Smoked Salmon Spread is so quick to make that I can make it in 5 minutes. Make it in the morning and let it refrigerate for a few hours or overnight to let the flavours blend. What could be better than a 4 ingredient dip? Especially when it is this good. 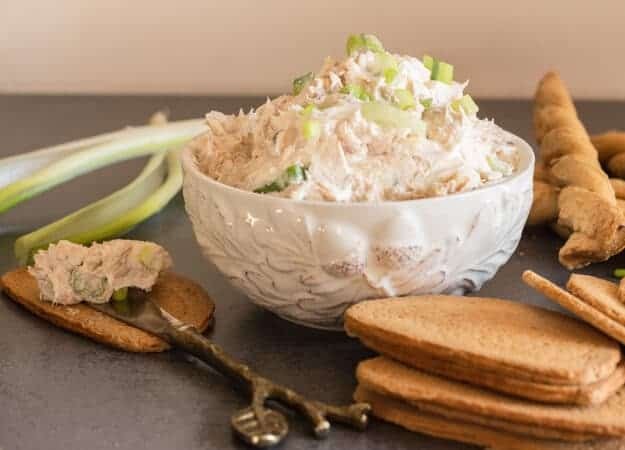 This Salmon Spread is the perfect New Years appetizer spread, just have crackers and/or some crusty bread and you will be all set. And with Salmon as the main ingredient you know it is healthy too. 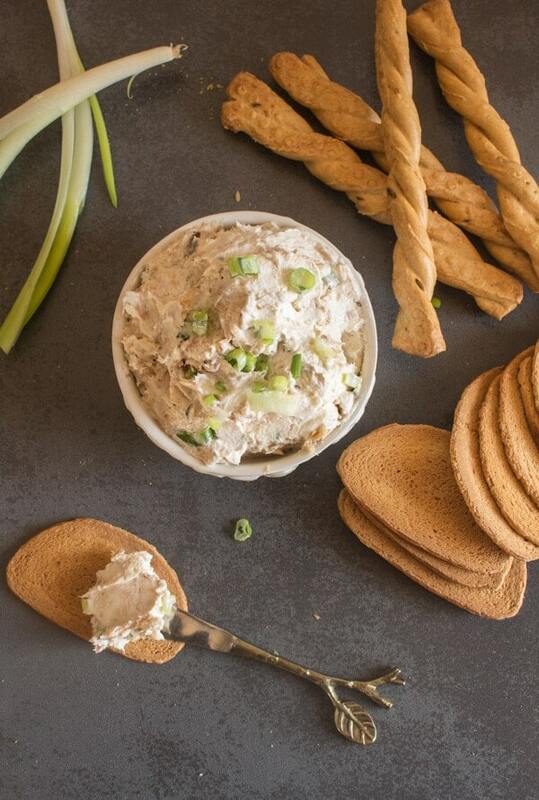 Make it even healthier and use light cream cheese and serve it with whole wheat crackers. Believe me this is one appetizer spread you will be making again. Enjoy! 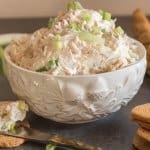 Easy Smoked Salmon Spread a fast, easy and so delicious appetizer spread made with canned salmon and cream cheese. Drain and clean salmon, (reserve 2 teaspoons of salmon liquid), flake the salmon. In a medium-sized bowl combine cream cheese, liquid smoke flavouring and salmon liquid, blend thoroughly. Stir in green onion then fold in salmon. Refrigerate for at least 2 hours or overnight. Enjoy! Once upon a time, my sister in law had a salmon spread and I lost the recipe . . . thanks for saving the day Rose! Hope you’re enjoying the new year! Hi Roz, glad I could save the day! So far so good with the New Year. Happy New Year to you too. Sounds very tasty! We had our smoked salmon in the breakfast casserole I made. It was delicious! In fact the photo shot i got was of the casserole almost all gone. Those grandsons are like locusts when it comes to food. But it makes this nonna happy to provide them with food. Hi Marisa, love smoked salmon. I have never made a breakfast casserole, would love to try one though, yours sounds delicious.